So the first giveaway in my summer reading series was wrapped up last night, and two winners have been selected. That is right, TWO! 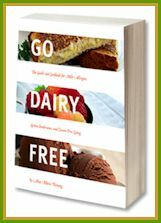 So many of you seemed to be wanting a copy of Go Dairy Free (**blushing**), that I am going to send a copy to a second winner personally. Comment #36, Jocelyn – “I would love to win Vegan Cupcakes Take Over the World. I have your book, Alisa and it is awesome. I’m so glad my husband bought it for me especially since I’m moving from a large urban city to a small town very soon.” – Jocelyn, flattering obviously gets you everywhere in the random selection world! Vegan Cupcakes coming out to you from Snubbr. Comment #74, Clover – “They all look good. My top choice is GO DAIRY FREE and second is the cupcake one. My family are huge cupcake fans. Me and my 10 month only son have been dairy free for about 9 months and its hasnt improved yet, It would be nice to branch out my recipes. 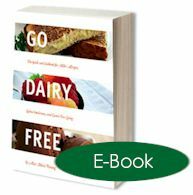 Thanks.” – Clover, if I had an extra copy of Vegan Cupcakes, I would send it too, but regardless, a free copy of Go Dairy Free is coming your way! 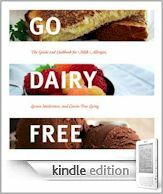 We finally finished some formatting upgrades on the Kindle version of Go Dairy Free, making it much more kindle-compatible for viewing. Plus, thanks to some changes with Amazon Kindle, I was able to lower the price! It is now just $9.99!! For PC Users (or non-Kindle junkies), I have decided to match the price with our PDF ebook version. So all ebook versions of Go Dairy Free will now be just $9.99!! The PDF ebook version can be viewed on any computer, and is identical to the paperback book, even in formatting. Below are links to the book (I think the paperback is just $13.57 on Amazon! )and ebooks. Can you tell I am excited about getting with the digital age?! 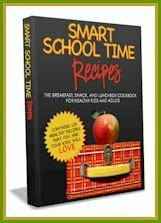 More book news, recipes, and giveaways (tomorrow in fact! ), coming up, so enjoy. WOW!!! I am so excited thank you so much. My family will thank you too as are meals are getting redundant!!! I meant “our” 🙂 Do I need to send my address some how? That is great news on the Kindle! Alisa, my husband and I just got back from having dinner at Crystal’s house, and for dessert, she served lemon bars from Go Dairy Free! They were delicious, and I loved the creamy filling with the sweet crumble. I plan to try your “condensed milk” filling as a stand-in for sweet cream cheese– it was so yummy!